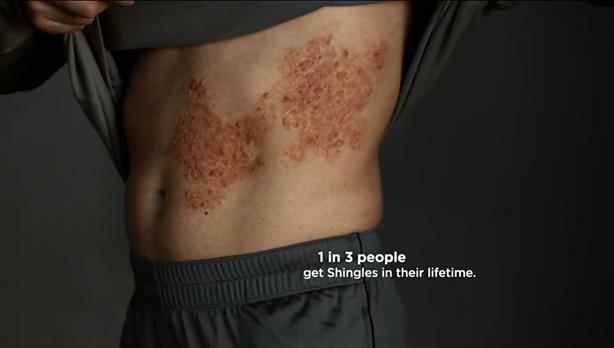 The drugmaker used the campaign showing the effects of shingles to promote Zostavax. Most advertisements for prescription drugs are bright, cheerful, and uplifting. But Merck’s advertisements for shingles vaccine Zostavax took a decidedly different route. The ads feature a woman, Linda, swimming alone in a pool while an ominous voice-over, the shingles virus personified, tells Linda that she is susceptible to the disease without her even knowing it. The threatening narration, accompanied by unsettling music and images of the shingles rash, tops off the ad’s scare factor. "One in three people will get me in their lifetime, Linda. Will it be you?" the voice taunts. Patrick Bergstedt, head of global marketing for Merck Vaccines, says the pharmaceutical firm decided to run with scare tactics because of the low rates of vaccination among seniors and adults. Annual flu vaccination rates are an example: Only about 40% of adults were vaccinated for the 2016-2017 flu season, according to the Centers for Disease Control and Prevention. "When we looked at 2016, we said, How do we improve coverage rates, how do we improve education, how do we improve awareness?" Bergstedt says. "So we decided to take a more serious tone," adding that initial results show an uptick in vaccination rates. Bergstedt points out that among all the commercials Merck tested, the ads with Linda achieved the best results among the target demographic. "What resonated was that Linda represents an everyday person who’s trying to do what she loves doing," Bergstedt explains. "A normal healthy person like her is at risk and this disease is preventable with a one-shot vaccine. I think that what resonated with people is the realization, ‘I am at risk and if I don’t get vaccinated this is a really going to impact my life.’"
To drive the point home, the ads even feature an image of an actual case of shingles. The blistering red rash appears on-screen for several seconds. The vaccine’s print ads, which ran in magazines targeting 50-year-olds, also show graphic photos of the rash. "It is a pretty average picture," Bergstedt says. "We didn’t take the most severe case. We took an average case of shingles in order to educate and make people aware." Before the Lurking Inside ad, Zostavax ran commercials featuring former football quarterback Terry Bradshaw. Those ads, however, which ran in 2014, were much more lighthearted, although Bradshaw spoke in detail about how painful the shingles virus is. "This is a deliberate change in tone," Bergstedt explains. "We are trying to connect at a different level, at more of a personal and more of an emotive level, because of the seriousness of the disease."